The present work reports the presence of Lionfish (Pterois volitans) in Los Frailes Archipelago, Venezuela. This is the first published record of Lionfish presence for this location and the extension of their invasive range to the South-East of the Caribbean Sea. Lionfishes (family Scorpaenidae) are the first marine fishes to invade the Western Atlantic Ocean and Caribbean Sea; both the Red Lionfish Pterois volitans (Linnaeus, 1758) and the Devil Firefish Pterois miles (Bennett, 1828) have estab-lished in this region, beyond their native range in the Indo-Pacific, and spread with remarkable speed (Hamner et al. 2007; Schofield 2010). Pterois miles is usually less abundant and studies based on analysis of mitochondrial cyt b, have demonstrated that only 7% of specimens ana-lyzed in the invaded area represented that spe-cies, identifying the other 93% as P. volitans (Hamner et al. 2007). The first documented capture of lionfish in the Atlantic waters was in 1985 southeastern of the Florida Peninsula (Morris and Akins 2009). Later in 1992, after Hurricane Andrew, a private aquarium was destroyed releasing several lionfish into Biscayne Bay, Florida (Hare and Whitfield 2003). Since then, several authors have confirmed an alarming dispersion along the Gulf of Mexico (Aguilar-Perera and Tuz-Sulub 2010; Santander-Monsalvo et al. 2012), the northwestern Atlantic Ocean and the Caribean Sea (Guerrero and Franco 2008; Lasso-Alcalá and Posada 2010; Alexander and Haynes 2011). In 2010, Schofield dated the geographic spread of lionfishes using USGS-NAS database not differentiating between the two invasive species of Pterois genera (P. volitans and P. miles). In this context, a specimen of Pterois volitans was photographed and recorded in situ underwa-ter during SCUBA dives in Los Frailes Archipel-ago in July 2011 (Figure 1). The species was identified retrospectively using the original de-scription, video and photographs, alongside with other published photographs (Schultz 1986; Fro-ese and Pauly 2012). Due to the lack of a permit this specimen was not collected. Figure 1: Photographs taken of a specimen of Lionfish (Pterois volitans) during SCUBA dives in Los Frailes Archipelago, Venezuela.. 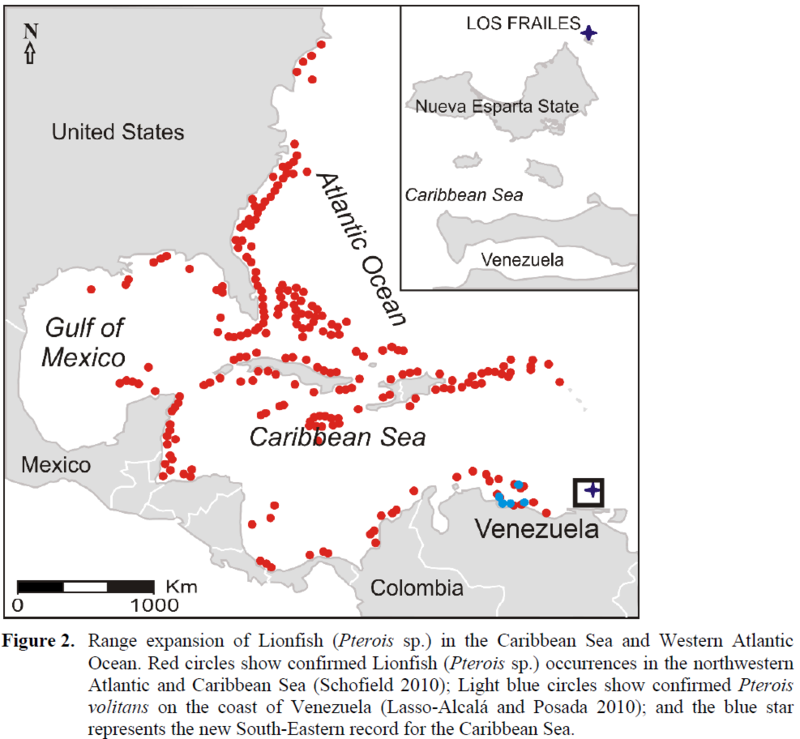 This is the first published record with photo-graph of Lionfish (Pterois volitans) presence for this location and the extension of their invasive range to the south-east of the Caribbean Sea (Figure 2). Figure 2: Range expansion of Lionfish (Pterois sp.) in the Caribbean Sea and Western Atlantic Ocean. Red circles show confirmed Lionfish (Pterois sp.) occurrences in the northwestern Atlantic and Caribbean Sea (Schofield 2010); Light blue circles show confirmed Pterois volitans on the coast of Venezuela (Lasso-Alcalá and Posada 2010); and the blue star represents the new South-Eastern record for the Caribbean Sea. 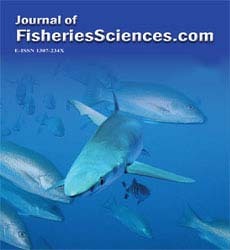 Authors are indebted to the Consejo Nacional de Investigaciones Científicas y Técnicas (CONICET), and to Martin Rada and people from the Science Museum of Caracas and the Marine Museum of Margarita, Venezuela for assistance on species identification. Alexander, A.K., Haynes J.M., (2011). Red Lion-fish (Pterois volitans) invade San Salvador, Bahamas: No early effects on coral and fish communities, The International Journal of Bahamian Studies, 17(2): 50–66. Froese, R., Pauly D. Editors, (2012). FishBase. World Wide Web electronic publication. Electronic Database Accessible at http://www.fishbase.org/ (Captured on 8 November 2012). Hare, J.A., Whitfield P.E., (2003). An integrated assessment of the introduction of Lionfish (Pterois volitans/miles complex) to the western Atlantic Ocean. NOAA Technical Memorandum NOS NCCOS 2. 21 pp.